Reel mowers are typically push mowers. A push mower is a lawn mower that does not use a motor. Instead, it is propelled by the user. It has between five and eight blades made from steel. 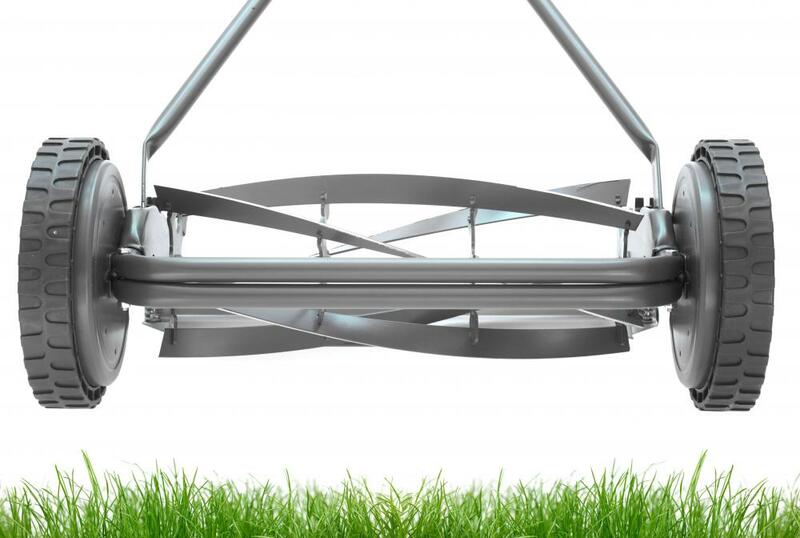 These blades revolve perpendicular to the ground. 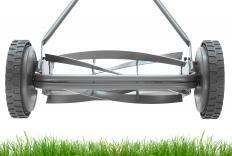 As the user pushes the mower, the blades turn and cut the grass in a scissor-like movement. Some people choose to use a push lawn mower because it is quieter than a conventional power mower. While power mowers contribute to noise pollution, a simple push mower can be used without any loud noises heard in the neighborhood. This is an ideal mower for those who need to use the mower early in the morning or late at night when others may be sleeping. Push mowers cut the lawn better than power mowers. A push mower is precise, creating a fine cut with its scissor-like snipping. This seals the grass blade and locks in moisture. Cutting the lawn in this manner prevents lawn disease and does not interfere with the natural growth of the grass. In contrast, a power mower tears and rips the grass, pulling up the grass as it cuts. Another advantage to a manual mower is the fact that this type of lawn equipment produces natural mulch which decomposes quickly. This releases valuable nutrients into the lawn's soil, contributing to the overall health of the lawn. For this reason, people who desire to have a beautiful, healthy lawn may consider purchasing push mowers. Homeowners who decide to invest in a push mower enjoy other perks as well. Push mowers don't have engines like power mowers so users don't have to worry about engines that refuse to start. They don't have to purchase gasoline for the mower or pay for complex engine repairs. Push mowers are lightweight and are often easier to push than a power mower. Push mowers don't contribute to air pollution, because they don't release toxic fumes into the environment. Push mowers even take up less space in the garage or shed. An important advantage to health-conscious homeowners is that a push mower provides the user with physical exercise since it requires a person to push it across the lawn. To maintain a push mower, make sure that it is cleaned on a regular basis. This will ensure that the machine continues to function properly. The cutting bar should be adjusted correctly, not too loose and not too tight. Use a product like WD-40® to ensure that the moving parts are lubricated well. After a few years, the blades may need to be re-sharpened. This task can be completed at a lawn mower repair shop or at home with the proper equipment. A person who uses a push lawn mower should realize that they can be dangerous if not used correctly. Never place hands and feet inside the push mower's reel; the blades are sharp and can lead to serious injury. Don't mow a wet lawn since this can cause the user to slip and get injured by the blades. Users should never use the mower while barefoot or wearing sandals. How Many People Get Injured by Lawn Mowers? What Are the Different Types of Yard Trimmers? What is a Tractor Mower? I wish all my neighbors had push mowers! It would be so much better than the riding mower cacophony that starts up on nice Saturday mornings in the summer when I'd like to sleep in. I'd be fine with a push mower for my yard. I like the amount of control you get with a push mower, and there's no danger of one running off on you, or turning over with you. I have known people who were seriously injured when their riding mowers turned over on top of them. I like the green aspect of push mowers, the quiet and the safety they offer. I know they're more work, but I could use the exercise, and I don't have a one-acre yard that necessitates a riding mower. I want either a battery operated electric mower or a push mower. We have a postage-stamp sized front yard, and a push mower would take care of our yard nicely. Our landlady has hired these numbskulls who have to be shown everything in the yard that they don't need to bother. Otherwise, they will mow it all down. I had caladium *planted* under my dogwood tree. It was red and pink and impossible to miss. Unless you were these guys, that is. They managed to find it and mowed it over. I showed it to them and they looked at me like I was speaking Sanskrit. I could have slapped them. So yes, I'd very much like a push mower.